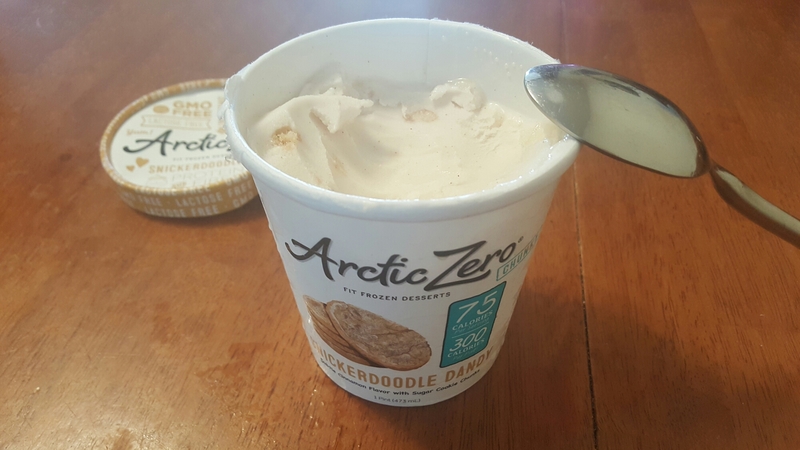 Arctic Zero is a company that makes low calorie desserts. Finally you can feed your cravings without the guilt! Even if you overindulge, most of the pints are at 300 calories each. I was so excited when Arctic Zero agreed to send me a case of their newest flavors to try out, and all they asked for was a shout out if I liked them. Well, I truly liked these desserts and decided an article dedicated to them was needed. All of their desserts are primarily made of whey protein concentrate and happen to be lactose and gmo free. They are also kosher, low glycemic and gluten-free. The eight ingredients all the desserts have in common are: whey protein concentrate, Â monk fruit concentrate, fiber, Â natural flavors, sea salt, organic cane sugar, plant based stabilizers, and purified water. The protein and fiber make this a good post workout snack or an anytime of the day treat when you get a craving for something sweet. The pints arrived in a box and once I opened it, I could not help but smile since it looked like a beautifully wrapped gift. Then again, having yummy pints of frozen dessert delivered to your door is a nice gift all on its own! The new flavors are ( from left to right) banana pudding, Â cake batter, Â brownie blast, Â snickerdoodle dandy, Â and poppin’ pomegranate. Cake batter is the lowest calories at 150 per pint. Talk about indulging without regret! 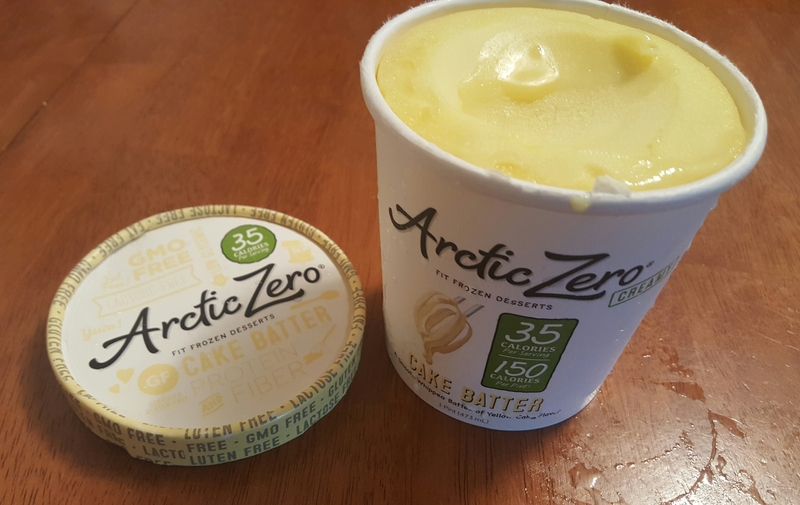 It tastes good, not too sweet.Â Does remind me of yellow cake batter, so Arctic Zero did a good job recreating the flavor. Snickerdoodle dandy is also a 300 calorie per pint dessert. It’s a chunky style one, and I am happy to say you definitely are reminded of a snickerdoodle cookie when eating it. It’s got that whole yummy cinnamon taste and the chunks of cookie incorporated are a perfect blend. Banana pudding was another chunky style with 300 calories for the full pint. It had vanilla wafer crumble mixed in, which gave the banana a nice texture. The taste did remind me of eating banana pudding, although the banana flavor was a little intense. The thing I liked about this one, was that even though it was a chunky style one, the banana itself was very creamy, so the wafer crumble complimented it nicely. Poppin’ pomegranate was the last one I tried. The taste did remind me of pomegranate, but honestly it wasn’t my favorite it was a little too sweet for my taste. Overall, I think the idea of low calorie, lactose-free frozen desserts is an awesome one. The addition of protein and fiber is another plus. I enjoyed tasting all the yummy new flavors and will definitely be purchasing more of the brownie blast when I get a craving. That flavor was definitely you favorite. 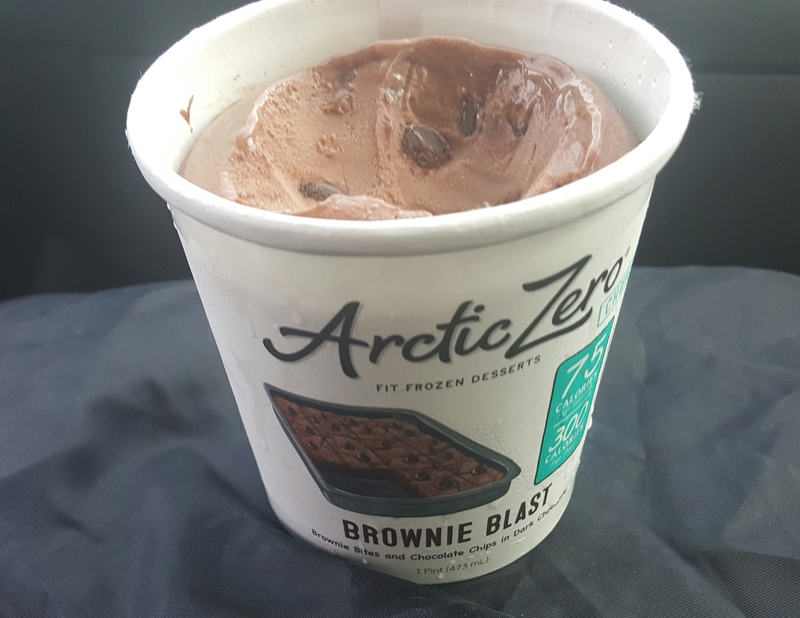 Have you tried Arctic Zero fit frozen desserts? Which is your favorite flavor? !